Good morning, dear friends! This weekend we finally broke into some fall festivities and enjoyed some harvest festival fun with some friends of ours. My husband’s friend Panda made a list of fall things for us to do this year that he was very excited about. I too was very excited about this list as I love fall and all of the fun fall activities that go with it. We’re getting kind of a late start on the list, but we finally crossed the first couple things off: Harvest festival and Corn maze. Panda had looked up a couple different harvest fests in our general area and we picked one that looked promising and had free admission. Logan and I got our customary late start as we sluggishly got out of bed and dressed and showered and made coffee and drove right passed the nearest gas station before realizing we needed gas and couldn’t really turn around. So we went passed the exit we needed to go to a sheetz a little farther down and then came back up to get on the turnpike and still made it by 10:30, which was not so bad. The first thing I spotted was a very pretty calico cat hanging out by the barn entrance, and then the Pandas, Panda and his wife Rachel, looking at the donkeys. My husband laughed at how excited I was about the cat, but really, it’s not very often you get to meet a new cat friend. The festival itself was unfortunately smaller than we expected. They seemed to have a short hay ride, a small corn maze for the kids that was more cardboard than corn, a pumpkin patch and the usual warm drinks and fallish foods for purchase and consumption. We stayed a little over an hour, looking at the animals they had on the farm and walking around the pumpkin patch. We met another pretty kitty cat who was white with a big grey spot on her head. She was very nice and let each of us take a turn petting her before moving on to the next group of people. We got some hot drinks and sat on hay bails for a while before browsing the country store tent for locally made jam and pies and such. We got raspberry jalapeno jelly, I think. We thought about getting little pumpkins, but we had just acquired several pumpkins from my dad’s garden, so it seemed a little silly. We may get some carving pumpkins eventually, though. So, an hour in we were bemoaning the lack of an actual corn maze and wondering what to do. 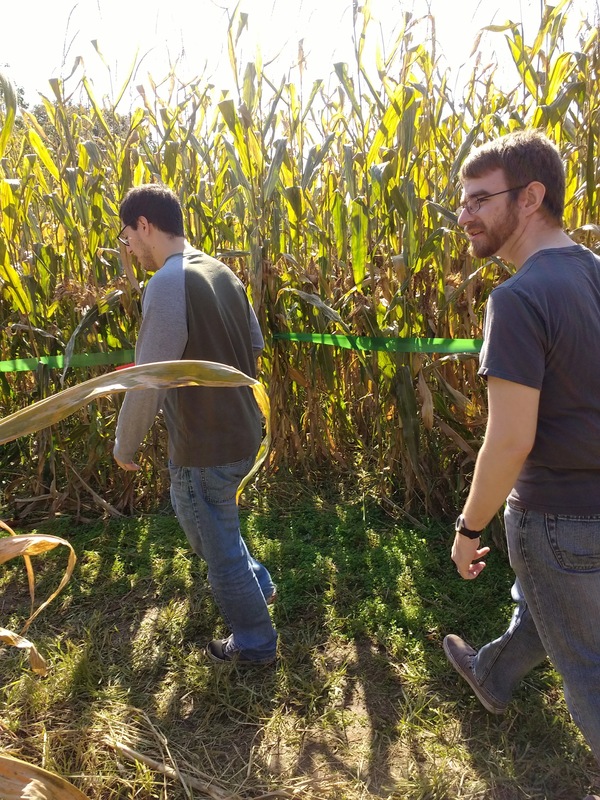 The internet was not on our side as none of us had a strong data connection and all were struggling, except me who just failed completely, to look up some local corn maze that was for adults as well. Logan managed to find the one he’d gone to in high school which they had enjoyed, but it was farther south than we wanted to go that day and the Panda’s had limited time as they were going to a birthday party later that day, so we scraped that and left the festival in search of a better data signal and a better corn maze. We ended up, eventually, at Mish Farms which is a meat market that happened to have a corn maze for some reason. The theme for the corn maze was “Our Farm.” I didn’t know corn mazes had themes, but apparently that’s a thing. We were given cards to mark off as we found the answers to seven questions about animal farming. We learned that it takes 350 squirts of milk to make up a gallon, that one pound of sheep’s wool makes 10 miles of yard and that a turnkey has a waddle under it’s beak and a snood over it. All very good information. I’m not sure how long we spent in the corn maze, but Panda was very determined to find all the answers while Rachel and I were kind of drooping from not really eating all day. 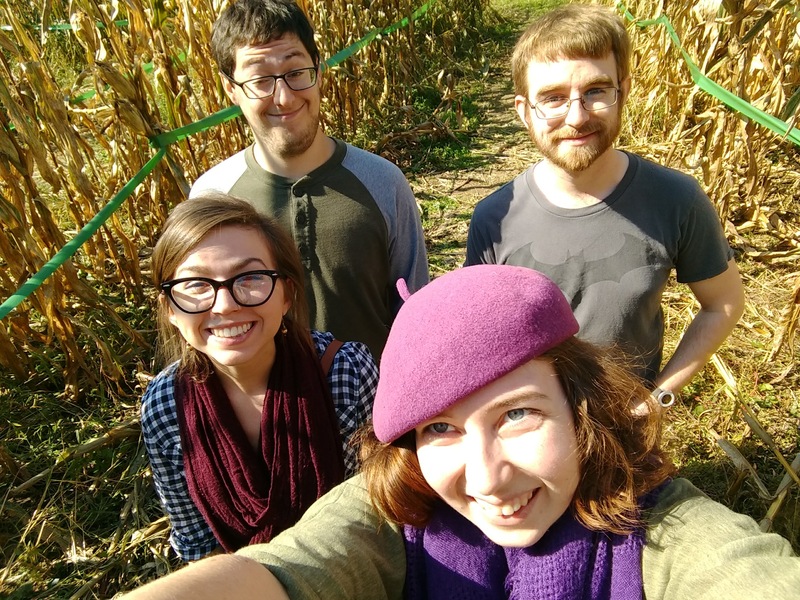 We did it, though, after going over the bridge to the other side of the corn maze and back through the children’s play area instead of over the bridge again, we managed to finally find all seven of the answers and make it out of the corn the way we came in. To be fair, we had found the exit previously and gone back in, so it wasn’t actually cheating to leave that way. For finishing the corn maze we got to put an animal paint stamp on their wall. I chose a chicken, because of course I would. Rachel picked a pig and Panda picked a goose which he placed kissing the pig in a very cute manner. Logan picked a group of little chicks for his stamp, so it kind of looks like we’re a family of four. No, we’re not trying to tell you something. Despite the fringes of a hunger headache, I had a very good time in the maze. We enjoyed a local restaurant that served very tasty sandwiches and mac and cheese for lunch and then headed home having conquered the corn maze and the harvest festival. Logan and I have plans to go to the one from his high school days this weekend with his sisters, and I’m pretty excited about that one too. It’s less of a maze, apparently, and more of a mapping exercise. They make a picture or message in the corn and you have to go through and try to figure out what it is by drawing it on graph paper. It sounds like a lot of fun. Still on the list is carving pumpkins and having a bonfire, which I don’t know if we’ll get to do. The bonfire, I mean. I think they’re planning to have that the night we’re doing Dread with Goose and the gang. As much as I enjoy bonfires, I’ve never played Dread and I really want to try it out! So yeah, that’ll be our big Halloween thing this year. I hope to also jump in some leaves when we go to rake them up properly. I didn’t a quick rake earlier so we could cut the grass. Unfortunately for my husband, I think it will need cut again before winter. The weather keeps flip flopping and it’s terribly troublesome. At any rate, I hope you are all enjoying your own fall festivities! Have a lovely day, my friends!